 I. F. Akyildiz, W. Su, Y. Sankarasubramaniam, E. Cayirci, "A Survey on Sensor Networks", IEEE Communications Magazine, vol. 40, no.8, pp. 102-114, Aug. 2002. I. Demirkol, C. Ersoy, F. Alagoz, "MAC Protocols for Wireless Sensor Networks: A Survey", IEEE Communications Magazine, vol. 44, Issue: 4, pp 115-121, April 2006. V. Potdar, A. Sharif, E. Changz, "Wireless Sensor Networks: A Survey", Bradford, Int. Conf. Advanced Information Networking and Application Workshops, pp 636-641, May 2009. M. Barnes, C. Conway, J. Mathews, D. Avrind, "ENS: An energy harvesting wireless sensor network platform", 5th International Conference on Systems and Network Communications, pp. 83-87, 2010. S. Roundy, D. Steingart, L. Frechette, P.K. Wright, and J.M. Rabaey, "Power Sources for Wireless Sensor Networks", In Proc. EWSN, pp.1-17, 2004. C. Park, P. H. Chou, "Ambimax: autonomous energy harvesting platform for multi-supply wireless sensor nodes", 3rd Annual IEEE Communications Society on Sensor and Ad Hoc Communications and Networks conference, California, pp. 168-177, 2006. E. Ekici, Y. Gu, D. Bozdag, "Mobility-Based Communication in Wireless Sensor Networks", IEEE Communications Magazine, pp. 56-62, July 2006. A. Kansal, M. Rahimi, D. Estrin, W.J. Kaiser, G.J. Pottie, M.B. Srivastava, "Controlled mobility for sustainable wireless sensor networks", 2004 First Annual IEEE Communications Society Conference, pp. 1-6, October 2004. P. B. Sujit, D. E. Lucani, J. B. Sousa, "Joint Route Planning for UAV and Sensor Network for Data Retrieval", Systems Conference (SysCon), 2013 IEEE International, pp 688-692, April 2013. Simi S, R. Kurup, S. Rao, "Distributed Task Allocation and Coordination Scheme for a Multi-UAV Sensor Network", Wireless and Optical Communications Networks (WOCN), 2013 Tenth International Conference, pp. 1-5, July 2013. L. Qian, C Fang, O. A. Dobre, H. Liu, J. Wu, "CA-MAC: A Novel MAC Protocol to Alleviate Congestion in Wireless Sensor Networks", Advances in Electrical and Computer Engineering, vol. 13, no. 4, pp. 41-46, 2013. 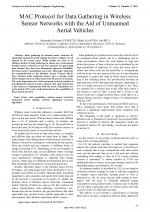 C. S. Fan, "Rich: Region-based Intelligent Cluster-Head Selection and Node Deployment Strategy in Concentric-based WSNs", Advances in Electrical and Computer Engineering, vol. 13, no. 4, pp. 3-8, 2013. W. Fang, S. Li, X. Liang, Z. Li, "Cluster-based Data Gathering in Long-Strip Wireless Sensor Networks", Advances in Electrical and Computer Engineering, vol. 12, no. 1, pp. 3-8, 2012. A. Rajandekar, B. Sikdar, "A survey of MAC Layer Issues and Protocol for Machine-to-Machine Communications", Internet of Things Journal, IEEE, vol. 2, issue 2, pp. 175-186, March 2015. D. Ho, S. Shimamoto, "Highly Reliable Communication Protocol for WSN-UAV System Employing TDMA and PFS Scheme", GLOBECOM Workshops, pp 1320-1324, December 2011. Z. Huang, N. Hiroki, K. Nei, O. Fumie, M. Ryu, B. Zhao, "Resource Allocation for Data Gathering in UAV-aided Wireless Sensor Networks", IEEE International Conference on Network Infrastructure and Digital Content (IC-NIDC 2014), pp. 11-16, September 2014. J-S. Lee, Y-W Su, C-C Shen, "A Comparative Study of Wireless Protocols: Bluetooth, UWB, ZigBee, and Wi-Fi", IEEE Industrial Electronics Society (IECON), Nov. 2007. D. Bhaskar, B. Mallick, "Performance Evaluation of MAC Protocol for IEEE 802.11, 802.11Ext. WLAN and IEEE 802.15.4 WPAN using NS-2", International Journal of Computer Applications, Vol. 119, No. 16, 2015. 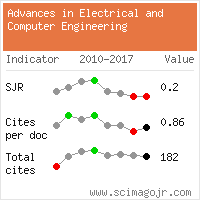 Citations for references updated on 2019-04-16 22:22 in 134 seconds.